Explanation: What lies beneath the surface of asteroid Eros? This image taken two weeks ago by the robot NEAR spacecraft orbiting the dark asteroid shows a kilometer-wide crater where some type of light material lies beneath some of the darker surface regolith. 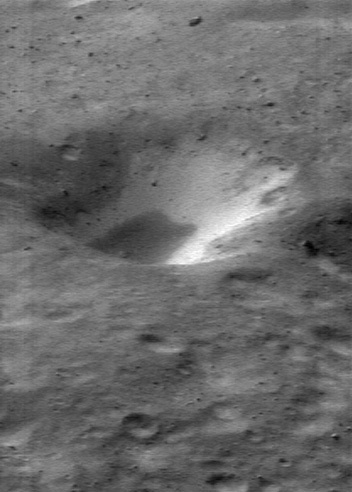 This light substance, seen on other photographs, may be relatively fresh material not yet well exposed to a darkening solar wind and micrometeorite impacts. As fuel wanes, NASA plans to end the NEAR spacecraft mission on February 12 with a spectacular controlled descent to the asteroid's surface. Although not designed to survive a landing, it is hoped that NEAR will be able to record and relay high-resolution pictures on its way down.